The two companies, Apple and Samsung, hold sway over the major smartphone markets of the world. Both the companies have received their fair share of accusations of copying and getting inspired by the other camp. However, now Samsung has done away with some features, whereas Apple has gone in for a larger display screen. This is common in Android devices, so what we actually have between the Note 5 and the iPhone 6S is two very similar devices. However, if you dive deeper, you will see the differences. Let’s take an in depth look at these two flagship devices from the two giant companies. Samsung has finally let go of plastic and moved to a metal/glass unibody. This means that storage can no longer be expanded and the battery cannot be replaced. Apple never had these features and the new 6S features a design similar to the 6 Plus. However, the 6S is thicker than and heavier when compared to the 6Plus. It comes with the 7000 series, aluminum with a layer that is pressure sensitive to use the 3D, touch feature of the iPhone. The iPhone is in full metal, whereas the Note 5 is metal between glass panels. Both look awesome and both are slippery in the hand. The Note 5 comes with a larger display of 5.7 inches compared to the 5.5 inches of the iPhone. 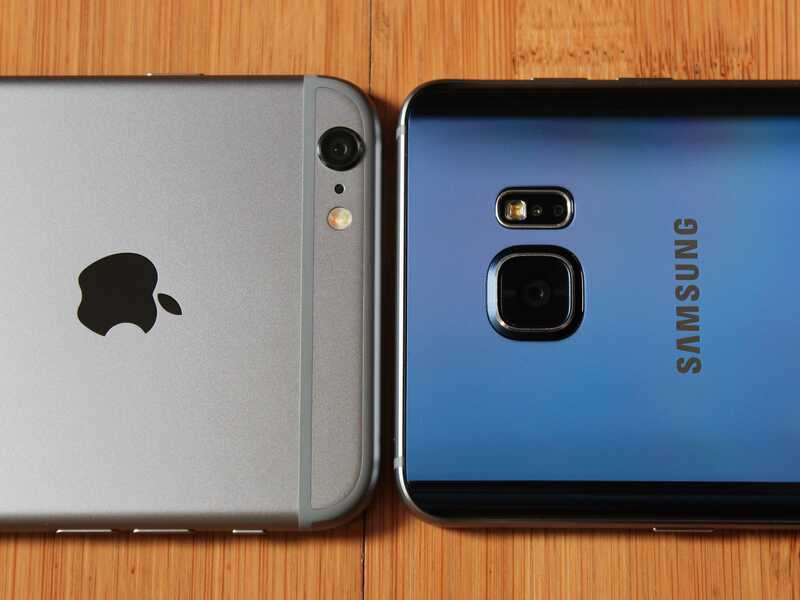 However, the Samsung device is compact and has sharp edges compared to the rounded edge of the iPhone. The Note 5 has a Super AMOLED display and a ppi of 518, whereas the iPhone has an IPS LCD display screen with a resolution of 1080 and 401 ppi. However, the clarity is the same in both the phones. The Note 5 is powered by the octa core, Exynos 7420 clocking at a speed of 2.1 GHz, with a RAM of 4 GB. On the other hand, Apple A9, dual core processor clocking at a speed of 1.84 GHZ and a RAM of 2 GB, powers the iPhone 6S. The ecosystems of the two phones are different, so the numbers don’t always give a clear picture. The performance of both the devices are equally good. Both the 6S Plus and the Note 5 come with fingerprint scanner, which is integrated with the home button. However, the Touch ID feature on the iPhone is swifter, whereas the one on the Note 5 gives users some extra time. The Note 5 is offered in two options of 32 GB as well as 64 GB, whereas the iPhone is available in 16 GB as well as 64 GB and 128 GB. Both don’t offer storage expansion features, so you will have to opt for the higher versions at a premium if you are a power user. The Note 5 has the S Pen stylus with great features for taking notes, crop a screenshot or capture a long passage and stitch it together and so on. It is easy to jot down an idea or share it. As for the iPhone, it has the new 3D Touch feature making use of a layer that is beneath the display and is sensitive to pressure. It allows showing of hidden menus, keeping the homescreen clean and offering additional functionality.